From the moment I tried asian food I knew these flavours are for me. I love the idea of few base ingredients that builds taste and additional ingredients finishing it. 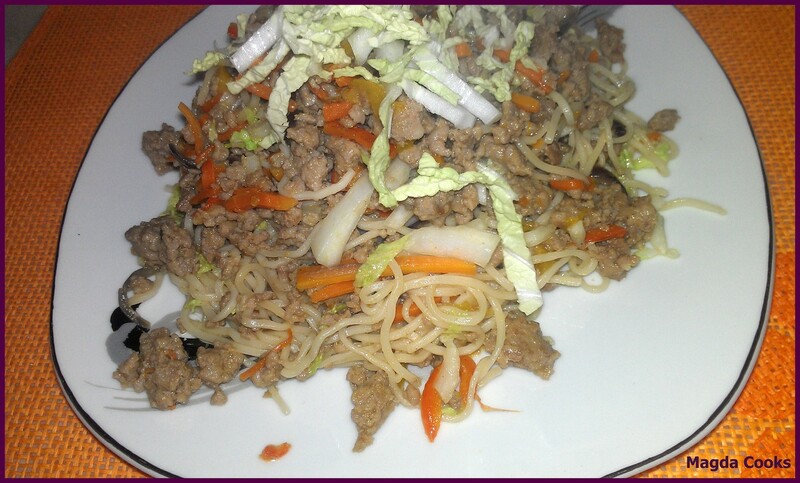 This time I found easy recipe for asian egg noodles fried with pork. Original recipe seemed poor on the veggie front so I changed it a little bit. Of course original base is with spring onions but I didn’t feel like going to the field store, so I used red onion. It’s a delicate meal but full of surprises. At the same time easy to make. First boil egg noodles along the instruction on the package, and set aside. In a bowl mix: pork meat, soy sauce, vinegar with honey and corn flour. Mix thoroughly to make sure ingredients merge, set aside. Cut all veggies into feather like strips, napa cabbage into thin ribbons, set aside. In the wok heat up oil, add onion and ginger, fry 30 seconds. Add meat, fry for 2-3 minutes then add carrots and pepper, fry next 5-7 minutes until meat is done and the veggies soften. Toss in egg noodles and pour bouillon and cook without covering 3-4 minutes or until noodles is heated. In the last minute add ¾ of napa cabbage and stir good. Serve right away sprinkled with leftover napa cabbage. Enjoy a dainty mix of flavours in home made asian food. P.S. Cookies thoughts: This meal worked REAL GOOD for me, excellent actually, as Magda Cooks… it just right!